There are numerous types of building constructed from earth. Cob is one of the oldest methods of this type of construction, involving the mixing of clay, sand and straw. The construction of buildings using the cob technique is different from other earth architecture, in that it does not require any wooden structure to form the walls. It also uses a higher straw content which makes it easier to bond together while making it stronger. This has replaced the old method of tramping the mixture by bare feet, although this is still practiced by many self-builders and while it is probably very good for the skin, I don't think I would like the straw sticking to my toes. This is another article in the series on building from green natural resources, in which we will look at the method of constructing cob buildings. Please note that as with previous articles on earth buildings, this is only a basic description of the various practices used in construction of cob buildings and not a building instruction manual. We shall start then, with the components used in the cob mixture and go on to look at the building techniques involved…. Clay – this can be as high as 50% of the mixture, and acts as a fixative, bonding the rest of the components together. Sand – the addition of 30% sand is filler and can help prevent cracks when drying out. Straw – The straw is cut into longer strands than are normally used in earth buildings mixes. There is also a bigger percentage used as well, as much as 20%, giving inherent strength. Unlike some other forms of earth building construction methods, cob building does not require a frame to form the walls. The walls should, however, be supported on some type of foundation, which should encompass the area of the ground floor to aid the laying of the floor. A damp-proof membrane should be stretched right across the whole area of the foundation. A dwarf wall of about 12" X 24" is sometimes built on top of the foundation to keep the cob clear of the ground and avoid possible water seepage into the base of the wall, which we will incorporate into our cob house. The materials of the cob are mixed with water to a doughy consistency, and a glob about a foot diameter is formed, then hand-tossed a few times, and then laid on top of the foundation damp-proof membrane. Another glob is added to the back of this to make the wall about 24" thick. This is continued for a couple of yards or so, then this layer of cob is leveled with a plastering float. The wall does not have to be straight, it can be any shape you want, however, it is better to keep it level from the start using a builders spirit level which is about 36" long. This process is continued right along the length of the wall, and by the time you reach the end, the first lot of mix applied should be ready for another layer of cob. And so the wall progresses; but if you feel the previous layer is not ready to continue building on, you can start another wall, leaving apertures for the doors and windows. Provided you smooth the cob layers and level them as you go, you can take your time with the process. Folks who have built their house with cob seem to find it a holistic experience, so enjoy! On finishing the final top layer of each wall, steel screwed rods can be pushed down into the cob to a depth of about 24", leaving 6" protruding. This is to facilitate the fastening of the wall/roof plate. The walls should now be left to thoroughly dry out. When dry they can given a good brushing using a wire brush to give an aesthetic finish, then a few coats of specialist earth building suspension applied to the outside surfaces of the walls as a damp proof measure. Recycled wooden joists and floorboards can be laid, but a compressed earth floor made from the cob mix will compliment your earth building, so we will go with this type. A floor is laid using the cob mixture and tamping it down as soon as it settles. Once almost dry, it can be leveled and smoothed over and left to thoroughly dry out before walking on it. Once completely dry, it can be polished up, this time using a proprietary floor sanding and polishing machine, the straw pieces giving a mottled effect. Because of the strength of the walls, the roof can be either pitched or flat, depending on which type you prefer. We shall use a flat roof, with a slope to drain away the rain water into the gutters. 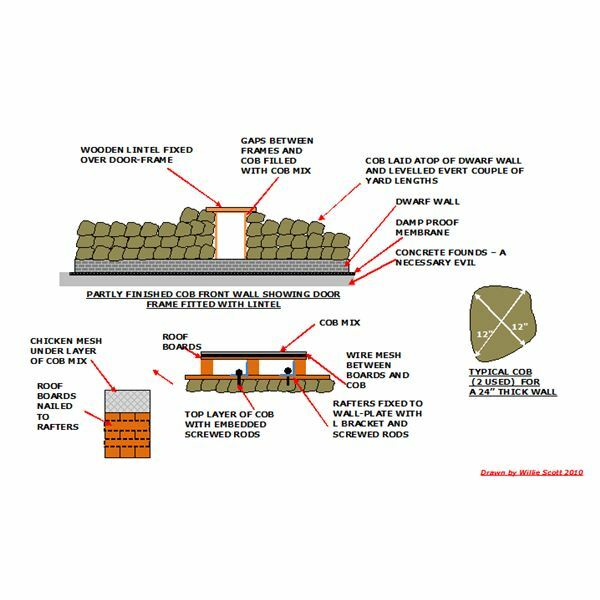 The roof should extend well over the outside surface of the walls, to prevent any water overflowing from the guttering from contacting the wall surface. The roof can be constructed from sheets of 1" plywood, or better still, reclaimed timber. Wood struts of 4"x 2"are fixed to the screwed rod and secured with a flat washer and a nut. The roofing boards can then be nailed to the struts. Recycled clay tiles can be fixed to the boards (see my article on recycling of building materials) but these appear to be expensive, so we will go with another older method of water proofing the roof using the cob mix. Galvanized steel chicken mesh is nailed onto the top of the roof boards. The cob mix is then spread over the mesh at a depth of 2" or so. It is then smoothed and treated as per the outside of the walls. The doors and windows can then be fitted, preferably staying with our environmentally friendly theme and using recycled components. The internal fixings and fittings can also be from recycled components, except for, electrical or gas appliances which should not be used. Now that you are finished why don’t you consider a couple of forms of renewable energy to provide heat and power to your cob home. I have written several articles on this subject and can be found on the Brighthub Website under the series, Energy Savings Tips for the Home. Building with cob has been around for a couple of centuries, being one of many forms of earth buildings. When completed, it is very strong due to the use of longer strands and extra quantities of straw; with the other materials being clay and sand. All three components are mixed with water to a sticky dough-like consistency, which allows globules of cob to be gathered up by hand and easily laid to form the dwelling walls. A pitch or flat roof can be fitted to your cob building, and water-proofed using clay tiles or a layer of cob mix. Floors are laid, again using the same mix, finished using an electric floor sander and polisher. The windows and doors can be supplied from a building construction materials recycling yard and several forms of renewable energy used for power and heat for your new home built from cob.